The costs associated with replacing poor performing pumps are not desired by most end users. One common reason for pumps underperforming is that the pump is reaching the end of its useful life. The repair costs are soaring and downtime is immense. If it is not the end of the useful life for the pump, then usually there are reasons why a pump does not perform in a given application. In many cases, it may be caused by misapplication of the wrong pump design or type. In most pump processes, there are multiple pump types that can perform in the service. The difficult part is finding an optimal solution that provides maximum reliability and lowest total cost of ownership. Plant personnel may find a pump design that performs well in one application and horribly in other similar applications within the plant. The plant may need to pay a higher price to get the optimal performing pumping solution. The Opequon Water Reclamation Facility in the city of Winchester, Virginia, faced similar issues. 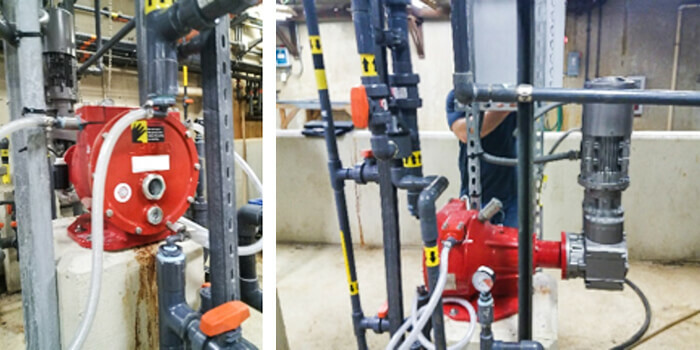 The facility invested in electric operated diaphragm metering pumps for delivery of acetic acid and ferric chloride for delivery of these acids. Automatic Controls of Virginia (ACVA) visited the facility and listened to the plant owners complaints about multiple and expensive failures. ACVA recommended that the city invest in a different pump design. The group recommended a peristaltic pump that uses a 360-degree eccentric roller that compresses the rubber hose only once per revolution. Many peristaltic pumps use two metal shoes or bumps to compress the rubber hose. These metal shoes compress the rubber hose twice per revolution and also generate a lot of heat. Double the number of compressions and heat can lead to shorter hose life for acetic acid delivery. The city first purchased a 1/2-inch peristaltic pump with an integrated frequency drive. The pump produces a pressure of 30 pounds per square inch gauge (psig) and a variable flow rate of 0.8 to 1.5 gallons per minute (gpm). The first pump has been operational at the city for nearly a year without a single repair. Shortly after, the city ordered another pump to deliver ferric chloride. That pump has also run without repairs for nearly six months. The former pumps cost less than half of the peristaltic pumps. However, the annual repair costs and repetitive downtime led the city to search for the optimal design. To avoid constant repair and maintenance costs, plants should look for a better design that fits their needs. Image 2. 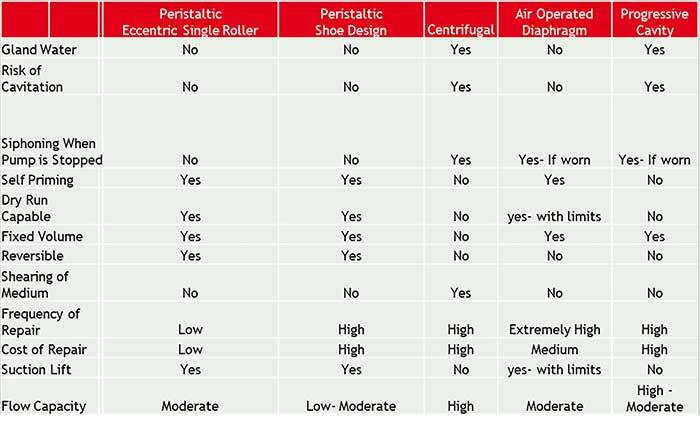 This table provides some suggestions about what type of pump to use depending on the situation. Industrial Internet of Things (IIoT) pump monitoring can be a solution to help understand pump issues and, better yet, reduce operating costs. If the pump is expensive to maintain or replace and is critical to the process, consider adding IIoT monitoring. There are many variables that can be monitored on different pump styles. For instance, a progressive cavity pump should never run dry. Positive head and flow should always be on the suction side of the pump. If this type of pump runs dry for even half a minute, the rotor and stator can be permanently damaged. Adding vibration sensors and flow meters can help diagnose and stop a pump before serious damage occurs. Main bearings, gear boxes and motors can be monitored so increasing vibration can be detected and an email or text can be sent to relevant personnel to diagnose and fix a small problem before it becomes significant and costly. Immense data can be captured from an integrated frequency drive. Any instrumentation that resides in the area of the pump that provides input to pump performance can be tapped into and monitored from a cloud-based portal. Alarms will be displayed on the cloud-based portal, but emails or text messages can be sent to relevant personnel for any alarm. Any asset that includes digital or analog instrumentation inputs can be monitored. Instrumentation has become much less expensive and easier to install. Some call this instrumentation “lick and stick.” It can be bolted on, or use magnets or adhesives.